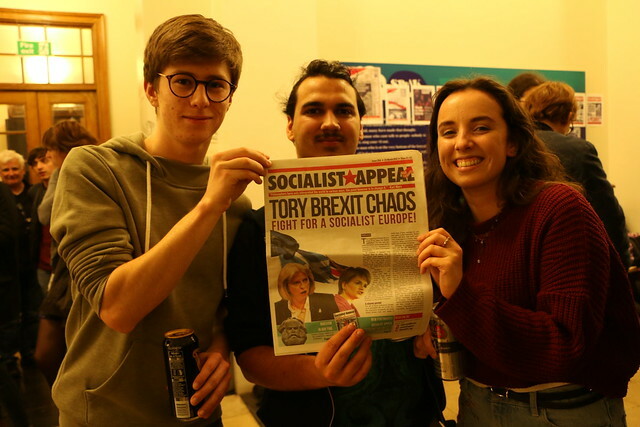 Not only was this the biggest and most successful conference yet, but it also marked the launch of the new fortnightly Socialist Appeal paper - a tremendous achievement and an important milestone for the forces of Marxism in Britain. The growing strength of the Marxist tendency was displayed both quantitatively and qualitatively throughout the weekend, with over 150 in attendance and an impressively sharp and astute political analysis provided by all comrades during the discussions. The mood in the conference amongst the notably youthful audience was one of incredible enthusiasm and optimism – not only because of the revolutionary conditions that are being prepared in Britain and internationally, but also because of the clear progress being made by the Marxists in building the most critical missing factor in the class struggle: that of a bold, militant revolutionary voice for the working class and youth. The move to a fortnightly publication of the Socialist Appeal was a clear indication to all at the conference of the strengthening of the Marxist tendency in Britain, and the new design in particular was warmly received. All were in agreement: this was the best conference of Socialist Appeal activists in the 25-year-long history of the paper – and a befitting tribute to celebrate the centenary anniversary of the inspiring events of the 1917 Russian Revolution. Alan Woods, editor of In Defence of Marxism, opened the conference on the Friday evening with an introduction to the discussion on world perspectives. In the space of one hour, Alan outlined the revolutionary developments unfolding across the globe, and in particular the turbulence and instability that can be seen economically, politically, and socially. Most notably, Alan highlighted, are the political crises that are breaking out in country after country, as the masses lash out against the Establishment and reject the broken status quo. It is this mood of anger and resentment against the existing order, Alan stressed, that lies behind the political earthquakes of Donald Trump’s election, the Brexit vote, and the rise of right-wing demagogues such as Le Pen in France. It is within this context of global volatility that we must understand the various processes taking place internationally: the crisis of the euro and the European Union; the decline of US imperialism and the changing balance of world relations; and the political polarisation seen in all countries, with sharp swings to the Left and to the Right. Many of the contributions from the floor developed these points made by Alan, with speakers providing concrete examples from the Netherlands, Italy, France, Poland, and the USA that demonstrate the collapse of the “centre ground” and the failure of the liberal status quo that had previously dominated for decades. Far from being the end of history, Alan noted in his summary, we can see that fall of the Soviet Union was merely the prelude to a far bigger crisis: that of the capitalist system. All the conditions are being prepared now for an enormous explosion of the class struggle in all countries. The pressing task is to build the forces of Marxism in preparation for these gigantic events. The discussion on world perspectives provided an ideal backdrop for Saturday’s opening session on perspectives for the class struggle in Britain, which was introduced by Rob Sewell, editor of Socialist Appeal. Rob spoke passionately about the enormous instability that is opening up in British politics. Once upon time, the UK was seen as a sleepy island where events moved at glacial speeds. Now, however, Britain is at the centre of the world crisis, with political earthquakes such as the (first) Scottish independence referendum and the Brexit vote shattering the fragile and delicate existing equilibrium. Above all, Rob stressed, we must understand how the contradictions inherent within the process mean that all things, sooner or later, must dialectically turn into their opposite. The most vivid expression of this is the chaos that is quickly enveloping the Tory Party and May’s government, with the electoral expenses scandal and Philip Hammond’s embarrassing Budget U-turn already weakening the Tories. These, however, are only the tip of the iceberg, and the Prime Minister will soon find herself embroiled and entangled in the impossible web of Brexit negotiations and IndyRef2. The apparently strength of the Tory government, as Rob explained, is therefore extremely superficial. May and the Tories could rapidly plunge in the polls as their party splits over Europe and the country is torn apart by the rising national question in Scotland and the North of Ireland. In such a scenario, Rob continued, the possibility of a Corbyn-led Labour government could become a real possibility. The ruling class would do everything to stop such an outcome, and would most certainly be prepared to try and split the Labour Party if necessary. At the same time, if Corbyn does not come out fighting boldly for grassroots members to reclaim and transform the Party, then the Labour leader could find himself isolated and the movement behind him suffocated. In either case, Rob concluded, it is clear that a period of enormous turbulence and intense class struggle lies ahead for workers and youth in Britain. The ideas of Marxism will gain a greater echo, as thousands of the most radicalised in society search for a way out of the impasse – for an alternative to the austerity, war, and racism of the Tories and the rotten system they defend. A number of speakers contributed to the discussion, elaborating on the different questions raised by Rob in his introduction. In particular, the issue and implications of a second Scottish referendum were debated, as was the approach that Marxists should take toward the question of Brexit and the demands that the Corbyn Labour leadership should fight for. Elsewhere, comrades developed the perspectives on the renewed crisis in the North of Ireland, the fractious splits in the Tory Party, the anti-Trump protests, and the growing radicalisation amongst young people. All were in agreement: never have such incredible prospects existed for the building of the forces of Marxism – for the building of the revolutionary leadership that is needed to offer a real alternative to capitalism. The Saturday afternoon saw the historic launch of the fortnightly paper – a fitting celebration of the centenary of the Russian Revolution, as well as a pertinent milestone after 25 years of publishing Socialist Appeal. National sales organiser James Kilby opened the official launch of the fortnightly by outlining the opportunities that a fortnightly paper opens up for spreading the ideas of Marxism. Not only does the increased tempo allow for more timely analysis of the turbulent events unfolding worldwide; it also gives more space to hear from the lives and struggles of workers in every area and walk of life. Comrades from across the country shared their enthusiasm for the new paper, and for using it to build a network of sellers in every neighbourhood, workplace, and campus. Despite the extra effort required to produce and sell this more frequently publication, comrades displayed their willingness to overcome all obstacles, and step up to the challenges ahead. This was most graphically displayed by the impressive financial collection at the end of the day, where – thanks to the sacrifice of comrades and supporters – the £10,000 fundraising target was met. With the crisis of capitalism intensifying on a world scale, the need for a weekly and even a daily Marxist paper has never been greater. The launch of the fortnightly is therefore an important step forward towards this goal, and will help Socialist Appeal become a focal point for all those who want to end the nightmare of capitalism and fight for a socialist world. 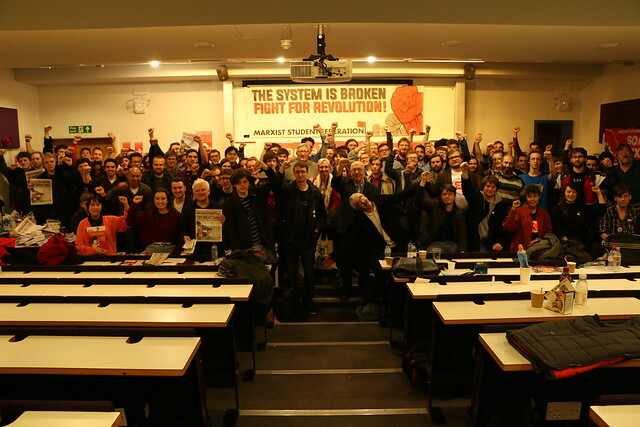 After a lively social on Saturday evening, attendees reconvened on Sunday morning to discuss how to build the forces of Marxism in Britain and internationally. Daniel Morley introduced the discussion about the work of the Marxists in Britain, describing the various successes achieved by Socialist Appeal and the Marxist Student Federation over the past year: from the 300-strong REVOLUTION! festival last October, to the vibrant youth bloc at the most recent NUS/UCU national demonstration, and the impressive campaigns run by Marxist students at Leeds and KCL universities and elsewhere. A variety of comrades reported on the activities being undertaken locally, as well as offering advice to young activists on how to spread the ideas of Marxism and connect with the ever-growing movements of workers and students. After lunch, Jorge Martin expanded the horizons of those present by providing a report of Marxist tendency internationally, discussing the work being done by the IMT in around 30 different countries – from Canada to Brazil, and from Italy to Pakistan. In all countries, as Jorge explained, the Marxists are seeing a rising interest in revolutionary ideas. The prospects for building the Marxist tendency have never been so great. Alan Woods returned to the stage to provide the closing remarks for the conference, accurately noting the mood of optimism and enthusiasm that was palpable amongst comrades. Above all, Alan emphasised, it is from the strength of our ideas that Marxists gain such a sense revolutionary optimism. Whilst all the bourgeois, the liberals, and the reformists weep and wail with their pessimistic predictions of doom and gloom, seeing no way out of capitalism’s morass, we are confident in the power of the working class to transform society. The main factor missing is that of the subjective factor: a revolutionary leadership for the mass movements of workers and youth. This is what Socialist Appeal activists in Britain are attempting to build. We implore all our readers to join us in this fight.